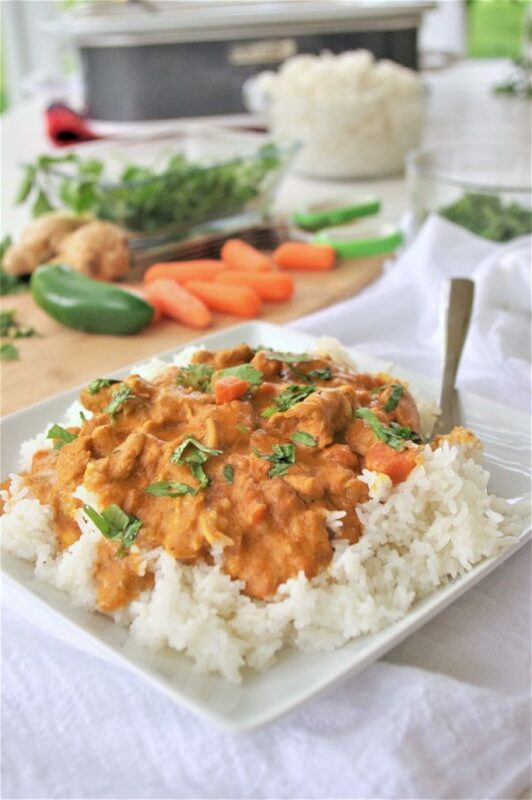 This AMAZING Thai inspired popular dish is easy to make in the crock pot with so much depth of flavor! 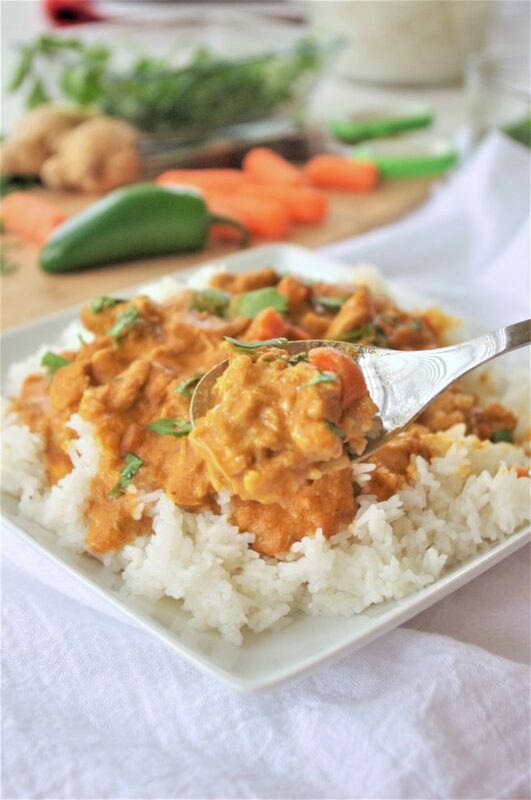 This is going to be your favorite new way to make coconut chicken curry for your family at home in your trusty slow cooker. Make sure you PIN THE IMAGE BELOW so you can always find your way back to this recipe. Truschoome – you are going to have some hungry family members begging for you to make it again. You aren’t going to BELIEVE how easy it is to make this at home. You might not already have garam masala or curry powder – but you NEED to get some! Once you try this, your family is going to be requesting it again and again so you’ll want to have a jar of each in your pantry at ALL times. It’s so easy to set out family style for everyone to enjoy and serve themselves. 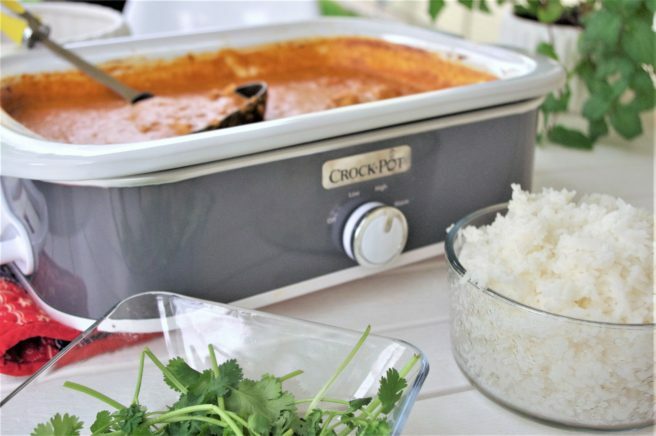 If you don’t already have one of these casserole style rectangular Crock Pots – you SO need to get one (or three). It cooks everything so nice and in an even layer and your ladle doesn’t sink way down getting all gicky. We eat this at least twice a month. At first it was once a week. For a reaaaally long time. Have I mentioned that it’s really, REALLY yummy? As amazing as it is the first day – it’s even MORE amazing the next day or three reheated as leftovers. Having any leftover, however, is going to be tricky. EVERYONE will want seconds. Even your picky eaters. 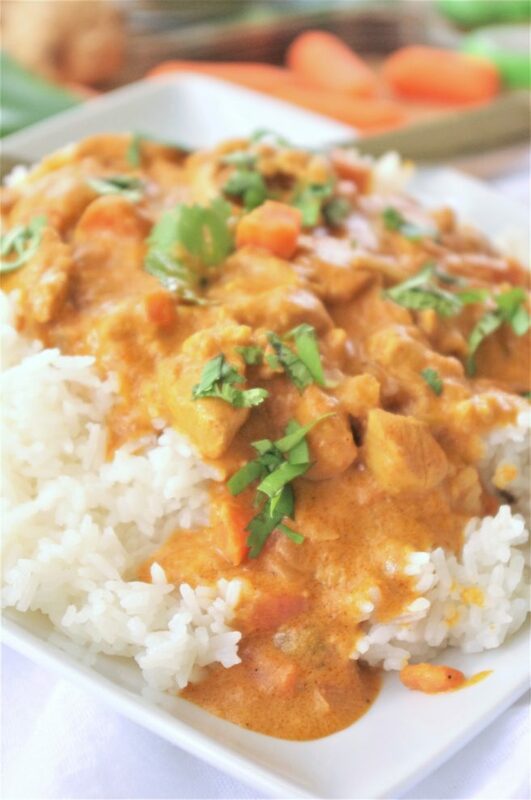 Easy to make in the crock pot with so much depth of flavor! 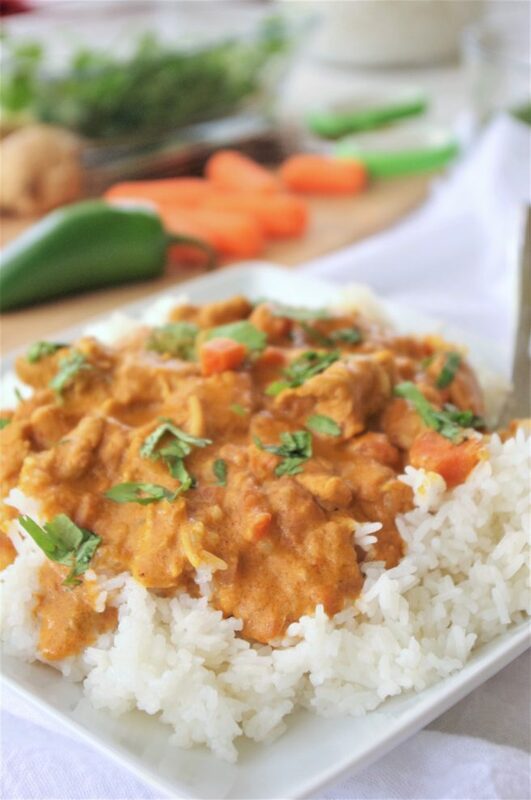 This is going to be your favorite new way to make coconut chicken curry for your family at home in the slow cooker. Cut up the raw chicken into apx. 1 inch/bite sized pieces and add it to the crockpot with the diced carrots. Saute chopped onion in butter or olive oil (or combination) over medium to medium high heat until just brown. Add in the Fresh peeled and grated ginger root and minced garlic and saute for an additional minute or two. Add the garam masala and salt, stirring to incorporate and toast the spices. Stir in the tomato paste, curry powder and finely diced jalapeno. If you want to create an extra smooth texture - puree this mixture in a food processor or blender. Add the mixture into the crockpot with the chicken and carrots and about 1/4 of the can of coconut milk and stir together well. Cover the remaining 3/4 can of coconut milk and refrigerate it during cooking time. Cook on low for 6 hours or on high for 4 hours. 1/2 hour before cooking time is up - create a paste by mixing the cornstarch and water (optional if you like a little thicker sauce). Add the paste to crockpot along with the remaining 3/4 can of coconut milk. Stir together well and let it cook on low thickening up for 20-30 minutes before serving. Serve with chopped fresh cilantro garnish and basmati or jasmine rice. Cut up the raw chicken into apx. 1 inch/bite sized pieces and add it to the crockpot with the diced carrots. In a medium mixing bowl, mix together all of the ingredients except the coconut milk, cornstarch and water, cilantro and butter/olive oil. Mix and blend well until smooth and incorporated. Add the mixture into the crockpot with the chicken and carrots along with 1/4 of the can of coconut milk and stir together well. Cover the remaining 3/4 can of coconut milk and refrigerate during cooking time. Cook on low for 6 hours or on high for 4 hours. 1/2 hour before cooking time is up - create a paste by mixing the cornstarch and water (optional if you like a little thicker sauce). Add the paste to crockpot along with the remaining 3/4 can of coconut milk. Stir together well and let it cook on low thickening up for 20-30 minutes before serving. Just made this and wow it was amazing! Thank you for sharing the recipe! You’re so welcome! I’m glad you liked it. It’s one of our favorite crock pot recipes. I made this in my crockpot today. It turned out great! I had I to improvise on the special spice, but it turned out great! My husband loved it! You are so welcome, Katie! Your modifications sound delicious – I’ll have to try the brown sugar next time. Thanks so much for making our day by letting us know your family enjoyed our recipe!